Need a quick and easy pasta dinner? Spaghetti Carbonara is simple pasta dish that contains only a few basic ingredients. I love spaghetti carbonara. It is a perfect quick and easy meal. It only contains a few basic ingredients and my whole family loves it. 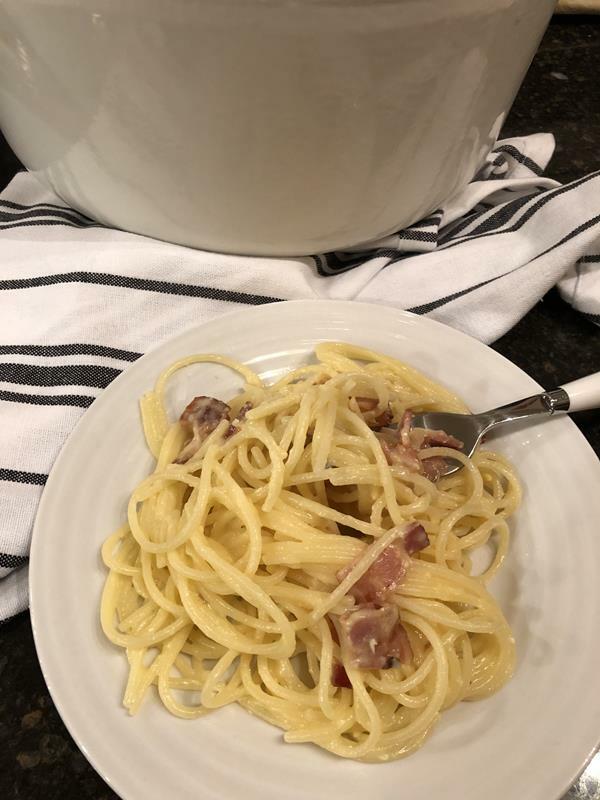 I have have several Spaghetti Carbonara recipes that I make, however I think this one is my favorite. 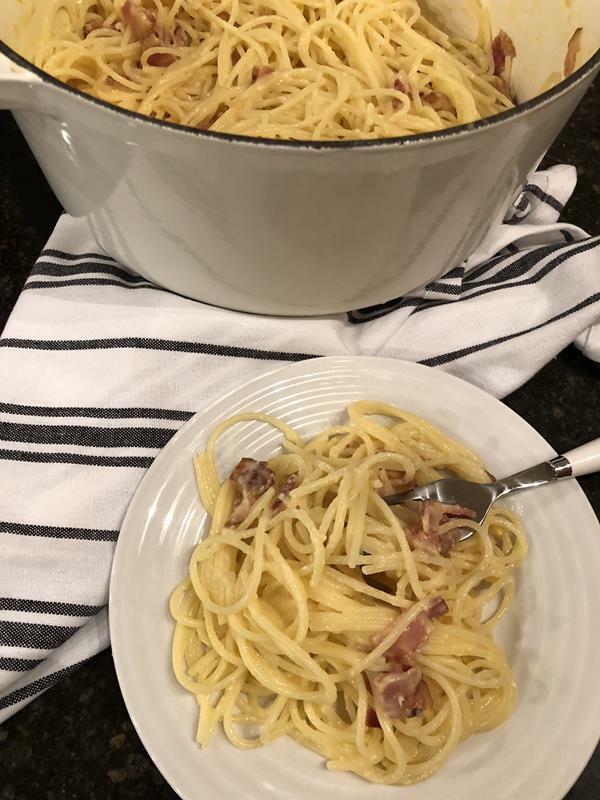 Years ago I saw a recipe for Spaghetti Carbonara in a Rachael Ray magazine. She changed her Spaghetti Carbonara up a little by using white wine in it. I thought this sounded like a great idea because I knew that it would add a lot of flavor to a basic pasta dish. I knew I needed to try it. Instead of using her recipe though, I decided to just use a basic Spaghetti Carbonara recipe that I had already made and loved and just added wine to it. The results were so good. In fact, it was the best Spaghetti Carbonara that I have made. The wine added just a little something extra and different to it. It gave it an extra depth of flavor, yet it didn’t taste like wine. I don’t like wine. Yes, I know. I am one of those people that don’t like coffee or wine. I don’t have anything against either one, I just don’t like them. I like to use wine in cooking for extra flavor and for tenderizing. But since I don’t love wine, I do not like my food to taste like wine. I like it to give it just a subtle depth of flavor without being overpowering. This is exactly what this recipe does. It adds great flavor without a super strong wine taste. 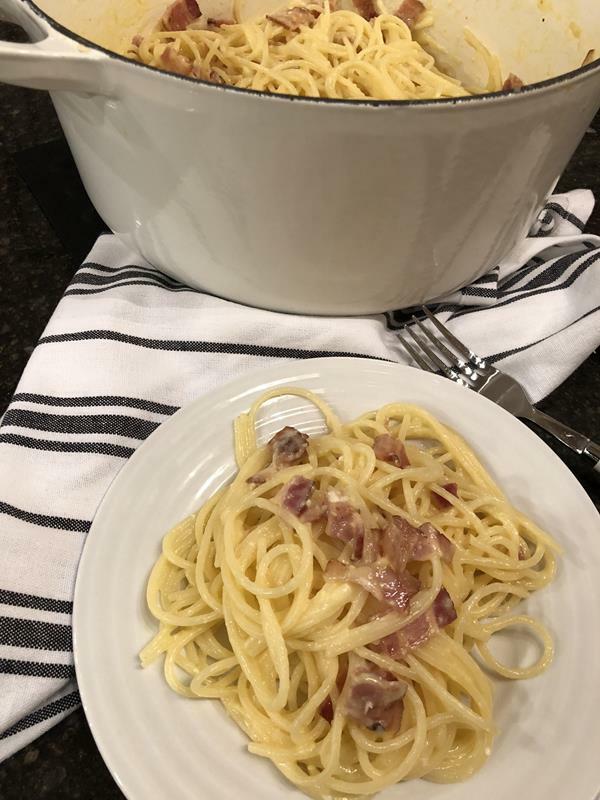 Spaghetti Carbonara is easy to make gluten free simply by using your favorite gluten free pasta. The ingredients are basic, so it is easy to make it gluten free. Spaghetti Carbonara is a quick and easy dinner to make using only a few ingredients. 1/2 cup parmesan cheese, not the stuff in the green can, the real shredded kind. Cook noodles according to directions on the package and drain. When noodles are done reserve 3/4 cup of pasta water for using in sauce. Drain remaining water from pasta. While pasta is cooking, cook bacon in a skillet or pan until done. Drain most of the fat off of the bacon. You so want to leave about 2 tablespoons of it. Carefully and slowly add wine. Cook for 3-4 minutes or until wine has reduced by about 1/2. In a large bowl combine eggs and cheese. Working quickly egg and cheese mixture to hot pasta. Stir until combined. Then add bacon/wine mixture. Cook over low heat, stirring constantly for 1-2 minutes. You want to cook it long enough to heat/cook the egg. Add reserved pasta water to achieve desired consistency. I like to add about 1/2 cup of reserved water. That looks delicious! I had pasta carbonara at the Macaroni Grill once and loved it. Now thanks to your easy recipe I can make it at home. Thanks! .-= Jen´s last blog ..Busy Busy Thursday =-. Looks Great! I will have to try this! Question: Is the recipe supposed to say 1/4 pound bacon….or is the 1/4 cup correct? Thanks! @Cindi, Thank you for catching that! Yes, it is supposed to be 1/4 pound. I fixed it so that it is correct now. Thanks again for letting me know about the error. Do you have a favorite white wine to use for cooking? I am the same in that I don’t drink any wine regularly, but I enjoy foods that are prepared with it for, as you said, the “subtle depth of flavor.” I just haven’t done anything in a while. @Jes, I am not sure I have a favorite brand of wine for cooking. I am far from an expert on that. 🙂 However, I discovered that many stores carry small bottles of wine. I prefer to buy those. They are 8 to 12 ounces, and I have found them in both white and red wine. I found that since I only use it for cooking, and even then not often, that I would buy a large bottle and six months later, it was still there 1/2 full and not tasting very well, even for use in cooking. Buying the smaller bottles, has really helped this. Yes, they are more money per ounce, but in the end I waste much less of it so it evens out. I hope that helps. Can’t go wrong with parmesan and bacon. This looks great. I just made this tonight and it was great. I made it with chicken stock instead of wine because I didnt have any. Thanks!